A month of contradictions and surprises, the end of Winter and the beginning of Spring. A shift in the seasons always leaves me feeling a little…confused, distracted by the changes in the world around me. But the days are lengthening and there are newborn lambs already in the field in the village next to our town by the sea. So goodbye February. The scent of freshly mown lawn surprises. So, here’s a poem to brighten up your day! 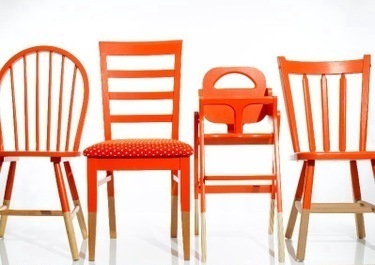 It’s dedicated to my love for the colour orange. Still striving to live by William Morris’ standard (you can read more about this here) and because the ceiling was falling down, we are decorating our dining room. Orange shall feature for sure. So, please close your eyes and think orange thoughts…I bet you’re feeling warmer already. And orange is reflected upon three walls. And seas to sink in to. Our longing to brush against summer-kissed limbs. And this is why orange. I’m so keen to finish reading A Christmas Carol before the twelfth night! For fear, if I don’t, of being visited by a Christmas spirit all of my own, whose purpose is to show me my every miserable shortcoming…Fortunately, it’s not a big ask because I’m enjoying the book so much! Dickens’ prose is to fall in love with. Well, the twelfth night is upon us. Usually I’m a little blue about it, wistfully putting away treasured decorations while contemplating the gloom and cold of January. But this year’s different. To start with, my spirits were lifted way up when I came across the January calendar page in the masterpiece Les Tres Riches Heures du Duc de Berry, supposedly the classic example of a medieval Book of Hours. Created somewhere between 1412-1416 by the Limbourg brothers, find out more about it and its important place in art history here! Isn’t is just fantastic? Has there ever been a more vibrant, colourful, feast-inspiring, celebrationary calendar page for January? Surely not. The Book of Hours, as well as calendar pages, is a book of prayers and other devotional exercises. I’m not normally so drawn to the religious in art. But I have been thinking a lot about Love during the twelve days of Christmas this year. Love with a capital L. When I was considering which poem to post in The Poetry Garden over the holidays, I kept coming back to Love (III) by George Herbert (1593-1633). As a student I remember feeling so frustrated that this poem was about a spiritual Love and not about a human love – which at 18 years old, was all that life (to me) was about. I see the poem so differently now and for some reason this Christmas, felt the urge to read it again, for the first time in years. And then, totally by chance Samantha from The Lady Journal liked the Poetry Garden’s last post and so I checked out her blog and came across a poem she’d written that moved me so much. Please check it out, it’s beautiful. And finally, last night we watched The Life of Pi (which I enjoyed – completely!) and again I find myself thinking about Love. Where’s it all going to end?! Tomorrow, I shall cook something special and invite someone who’d be alone around to share it with us. I’m thinking baked camembert with rosemary and garlic, and roasted root vegetables. And I shall take down our decorations with a smile upon my face, dreaming of a January filled with happiness and spiritual growth. And from this year, I’m going to introduce our family to the medieval tradition of gift-giving in January. Bring it on. I’m Loving life. How can I have denied myself Dickens’ delights for so long? Black-and-white, ‘times were hard back then’ TV adaptations and nostalgic images of Victoriana every which way you look (especially at Christmas) have been enough to satisfy. Up until now. The Poetry Garden’s festive reading is A Christmas Carol by Charles Dickens and I’m love, love, loving it! It was cold, bleak, biting weather: foggy withal: and he could hear the people in the court outside, go wheezing up and down, beating their hands upon their breasts, and stamping their feet upon the pavement-stones to warm them. The city clocks had ony just gone three, but it was quite dark already: it had not been light all day: and candles were flaring in the windows of the neighbouring offices, like ruddy smears upon the palpable brown air. The fog came pouring in at every chink and keyhole, and was so dense without, that although the court was of the narrowest, the houses opposite were mere phantoms. Today is a ‘through clouds’ sort of day and I find myself totally drawn into the artwork of the late nineteenth and early twentieth century artist Arkhip Kuindzhi. I recognise his paintings as I would an old friend and imagine myself happily surrounded by them. They suit where we live. He was able to save a little for the skies. Their collision a passion for between the clouds. In search of what is between. 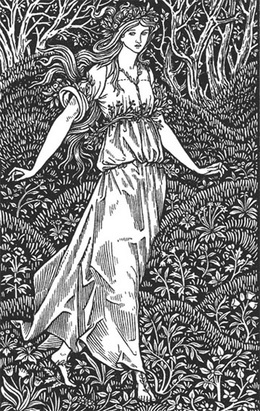 Illustration from William Morris’ fantasy novel The Wood Beyond The World (1894). Isn’t she gorgeous? Feminine yet heavy-limbed, somehow earthy and other-worldly. So simple! I’m going to try Mr Morris sir, to heed your wise words and to make a space in my head and home in which to be clear and honest, to live, be happy and create. While I go and tackle the ‘unuseful’ in my head and the chunk in our hallway, take a few moments to lose yourself in these amazing Morris designs…genius. No poem today. In fact I am in the mood for hibernation. Is it possible to be anything but at this time of year? A weakened sun seeps through autumn mists, illuminating burnished golds that I want to be wrapped up in. Daylight is brief, soporific and heavy with the smell of bed. So with this in mind I’m posting a photo to energise and lift the spirits, or at least lift the chin. Eyes-up y’all! I’ve heard it’s good for the soul. 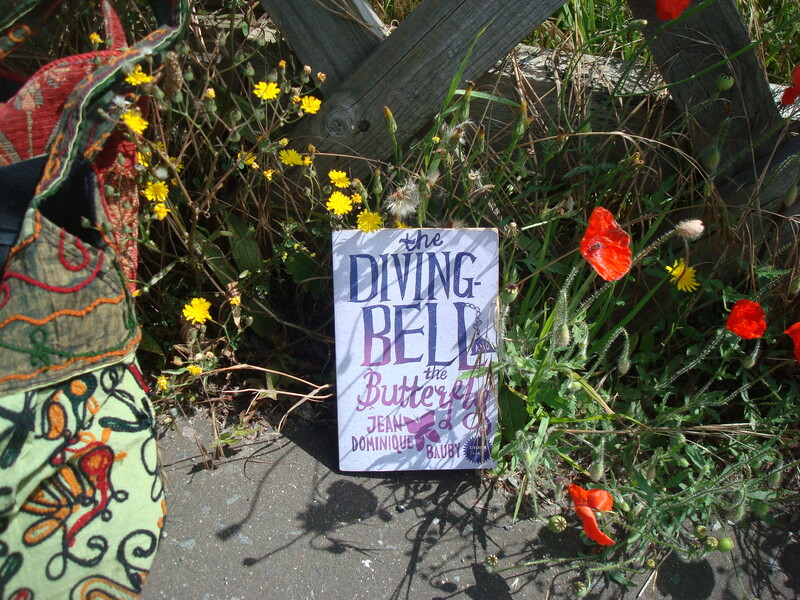 Typically late in getting round to must-read books, I’ve recently read Jean-Dominique Bauby’s The Diving Bell and The Butterfly. What an intriguing read. Touching and direct, it’s one man’s account of living with locked-in syndrome. With no place for the superfluous, the book has at its heart a strong sense of honesty and a poetic, almost lyrical rhythm. I find myself naively wondering whether Bauby’s economic use of language was an artistic choice, or a result of the means by which it was authored. How it was authored truly amazes me. Bauby’s only means of communication following the massive stroke that left him “imprisoned inside his own body, unable to speak or move” was to use his sole functioning muscle – in his left eyelid. And that’s how he wrote the book: painstakingly spelling each word by moving his left eyelid in response to an alphabet “rearranged according to the letters’ frequency of use”, recited over and over again by his bed-side assistant. Astounding. Reading The Diving Bell and The Butterfly has been a hugely relevant and timely experience for me. Firstly, my putting the book down coincided with Tony Nicklinson‘s passing, less than one week after having lost the legal battle to end his life as a sufferer of locked-in syndrome. His story was everywhere and rightly so. On a more personal level, over the last few years my family has been coming to terms with slowly losing a loved one to dementia and the effects of a brain tumour. I don’t like using the word ‘losing’ because it implies an ownership of some sort. And nobody owns anybody. It’s complicated, it’s often painful and it’s ongoing. Here’s a Kate Banks poem on such matters for you…It’s called The Slip. Can you catch me? I’m falling. Is this where his eyes, distilled by the paring down of life, are focused? A place to where those held by tubes, machines and progress have already gone? Here the journey’s end meets the beginning. Can you help me? I’m falling. The Poetry Garden is a sanctuary for my creative meanderings. So please, have a wander through the poems, prose and pictures. Thanks for dropping by!